2) How many “Sarah” persons without a surname do you have in your genealogy database? How many of them are your ancestor? 4) Tell us about your Sarah LNU ancestors with no surname. Perhaps someone will read it and help you out! 6) NOTE: If you don’t have any “Sarah” persons without a surname, then pick another female first name. Turns out, I don’t have any Sarah LNUs in my tree, so I’ve chosen to use the name Ann. 1) Ann LNU married Richard Gayler. Richard Gayler was christened in 1679 at Great Eversden, and was buried 15 November 1710 at Great Eversden. They had three children, and the first child was born at Dry Drayton, Cambridgeshire, so they were possibly married at Dry Drayton. I haven’t been able to find a marriage record for them yet. 2) Ann LNU married Nicholas Whimpey. Nicholas married Katharine Graunt on 27 September 1668 in Frome. There were two children born in 1669 and 1671/2 where no mother was listed on the baptism entries. From 1676, the baptism records for his children lists their mother as Ann. Ann and Katharine may have been the same person. Admission of Thomas Docwra on death of wife Anne, formerly Anne Wright. Messuage and 70 acres land called Mulletts or Molletts, copyhold of Manor of Mundon Hall [in Mundon]. Court of Thomas Western, esquire. 4) Ann LNU married Edward Docwra. Edward was born about 1718, possibly in Orwell, Cambridgeshire. He married Ann around 1740, and they had 3 children, William, Ann and Gamaliel. Ann was christened at Orwell in 1744, and Gamaliel was christened at Bassingbourn in 1747. I haven’t found a marriage record for Edward and Ann yet. 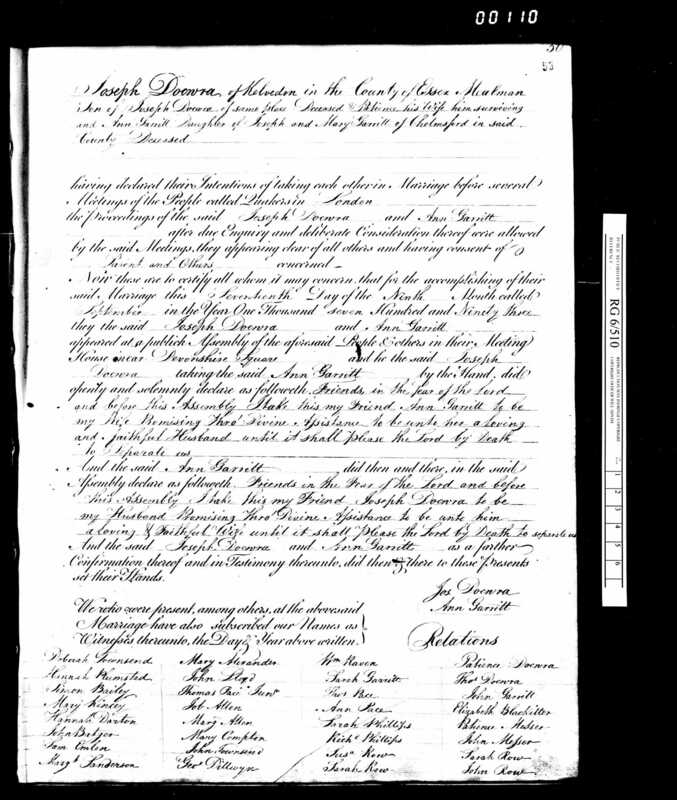 Ancestry.com Operations Inc, “England & Wales, Quaker Birth, Marriage, and Death Registers, 1578-1837,” database and images, Ancestry.com (http://home.ancestry.com.au/ : accessed 30 Oct 2016); marriage entry for Joseph Docwra and Ann Garritt, 17 September 1793 in London, England; Piece 0510: Monthly Meeting of Devonshire House, Houndsditch, London: Marriages (1776-1794). 6) Ann LNU married John Prain. John was born about 1850. The 1851 census showed him living with his parents, Thomas Prain and Elizabeth Coupar, in Errol, Perth, Scotland, so that was probably where he was born. I had followed John through the census years, and found him with a wife Ann. I now decided to try and find his marriage. I didn’t have much luck with ScotlandsPeople, so I tried FamilySearch, and found a marriage of John Prain to Ann Sharp, using these details, I was now able to find the marriage at ScotlandsPeople, and confirmed that John Prain, son of Thomas Prain and Elizabeth Coupar, married Ann Sharp, daughter of Alexander Sharp and Betsy Mitchell, on 31 December 1874 at Errol Village. So, of the 6 I have now confirmed the maiden name for 2, and I have a possible surname for 1, a possible alternate name for 1, while 2 remain LNUs.